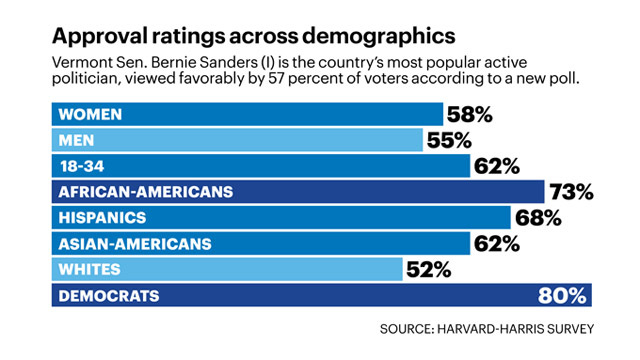 Sanders is viewed favorably by every ethnic group polled—from 52 percent among whites to 73 percent among African-Americans. If that’s not what “broad majority biracial appeal” looks like, I don’t know what would. 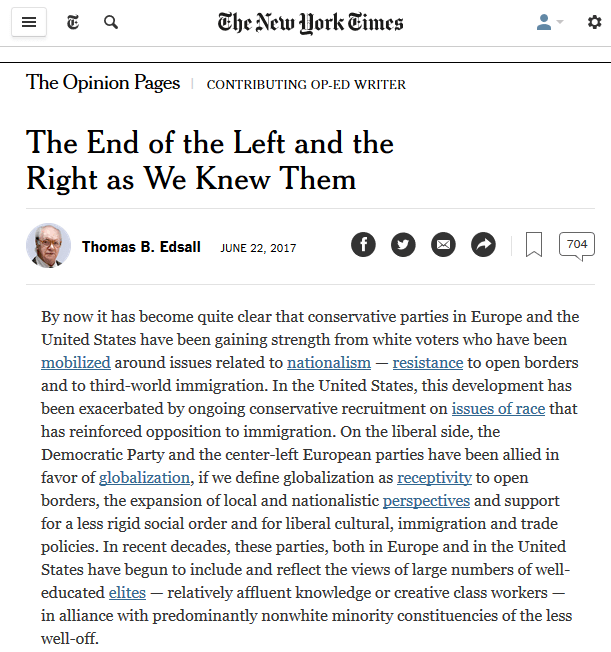 Thomas Edsall (New York Times, 6/22/17) declares “the end of left and right as we knew them.” But how well did he know them? In “The End of the Left and the Right as We Knew Them,” New York Times columnist Thomas Edsall (6/22/17) is back on his hobby horse—which is fine; what would a columnist do without a hobby horse or two? What’s troubling about it is how dishonest he is about it. The axe Edsall is grinding is that politics no longer has to do with rich or poor, but is now a question of “globalism versus nationalism.” It’s a variation on his class-no-longer-matters argument, or class-matters-backwards-from-the-way-you’d-think-it-does, as in “How Did the Democrats Become Favorites of the Rich?” (New York Times, 10/7/15)—a piece I examined at the time (10/15/17). This is a preoccupation of neoliberal pundits—who want nothing more than to believe that the economic positions of the Democratic Party are “irrelevant to its electoral predicament” (Jonathan Chait, New York, 6/18/17; FAIR.org, 6/20/17)—or even that the Democrats’ path to success involves “pro-business, finance-friendly economics” (Michael Lind, New York Times (4/16/16); FAIR.org, 4/25/16). But while Chait and Lind’s pro-corporate prescriptions for liberal politicians involve leaps of logic, neither of them seem so willing to fudge the data the way Edsall does. Say you’re writing a column about the relationship between class and politics. 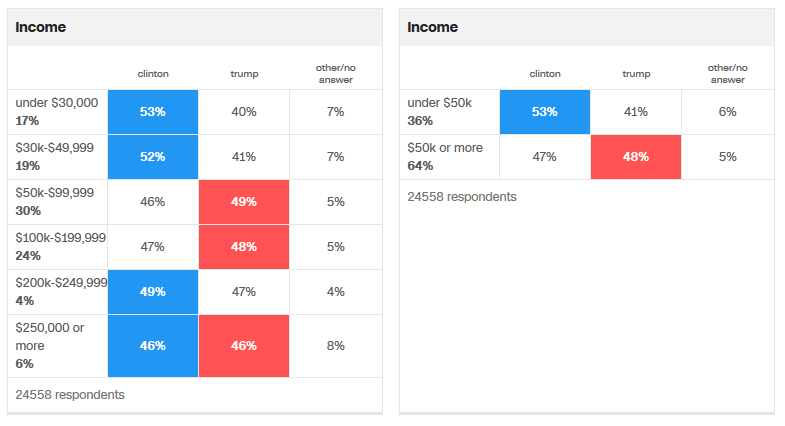 You look up the exit polling, and you can’t help but notice that Clinton did much better among people who make less than $50,000 than among people who make more than $50,000—winning the former by 12 percentage points, and losing the latter by 1 point. You choose to ignore that, however, and instead cherry-pick the data so it sounds like Clinton did better the further you go up the income scale—because that’s what fits with the story you’re peddling, that politics has entered a post-class era. I’d call that rather deceptive, wouldn’t you? A candidate making that appeal, however, and seeking to build a broad majority biracial coalition, must in fact have broad biracial appeal. As of now, Sanders is far from personifying broad majority biracial appeal. The Sanders-Warren wing of the party…has the moral high ground within Democratic ranks the votes they want the party to seek are those of some of the least reachable constituencies—white men and women whose views on immigration, race and political correctness are in direct conflict with liberal idealism. It would be an extraordinary challenge to get these particular voters to join with minorities and progressive activists. As I pointed out earlier this week, there are many voters in the United States who have progressive economic views and conservative social views. Is it possible to get them to vote for a Democrat based on economic appeals? Yes—that’s why Barack Obama won two terms. Exposure to difference, talking about difference and applauding difference—the hallmarks of liberal democracy—are the surest ways to aggravate those who are innately intolerant, and to guarantee the increased expression of their predispositions in manifestly intolerant attitudes and behaviors. Put away those rainbow flags, guys—you’re just riling up the neo-Nazis. If the building of a viable left coalition is possible, it is likely to require some thoughtful and humane co-optation in the form of deference to our limits and boundaries. If you reject from the outset the idea of uniting a majority based on shared economic interests, then pretty much all you’ve got left is the “thoughtful and humane co-optation” of racism and xenophobia.